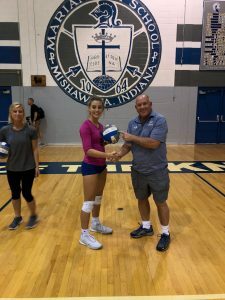 Bella Ravotto was recently named IHSVCA – 1st Team All State for the second year in a row. 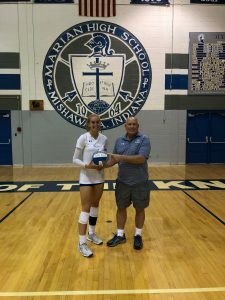 Bella wrapped up a brilliant career having been named to the NIC – 1st Team each of her four years, including the 2018 Conference Most Valuable Player. She holds the school record for Kills with 1,638 and finished with 1,413 Digs. Chloe Lentych was named IHSVCA – 2nd Team All State this past season, as well as selected to the NIC – 1st Team. Chloe ended her career with 1,263 Digs placing her in the 1,000 Dig Club as well. Congratulations to both Chloe and Bella on terrific careers at Marian. Chloe has chosen to continue her career at Findlay this upcoming Fall and Bella will play at Valparaiso.